LÀO CAI — With a sewing needle, a reel of thread and a piece of cloth on her person at all times, Lò Tả Mảy, 29, from Tả Phìn Village in the northern province of Lào Cai has all she needs to stitch her intricate embroidery, any time and any place. May is one of just a few ethnic Dao women in Tả Phìn – one of the most attractive tourism spots in Lào Cai – who are trying to preserve their embroidery craft. The traditional handicraft has stretched back through the generations but is now in danger of disappearing due to the boom in the market economy and the invasion of imported products in local markets across tourism areas. Like many other Dao women, Mảy is determined to uphold her ancestors’ occupation and pass it down to her daughter despite the low income. Mảy inherited her embroidery skills from her mother from the age of eight. “It is really a special occupation that my mother and grandmother handed down to me as an important tradition, and a way to support me and my family,” said Mảy. In Tả Phìn, which is home to about 3,000 people from the Red Dao and Mông ethnic groups, embroidery is a way of life for all women in the village. “A Dao woman must learn how to embroider from a young age. If not, it would shame her family. No one would respect her and she would be unable to find a husband,” according to Mảy. Mảy uses her spare time when she’s not working in the fields or doing the housework to embroider. “I’ve been teaching my child to embroider since she was seven years old, the same way I was taught. This helps my daughter not to forget where she is from,” Mảy said. Her daughter is now studying at a boarding school 30km from home but still embroiders, according to Mảy. Mảy is happy that teachers at her daughter’s school also teach her child and others how to improve their embroidery skills. “It’s amazing that the teachers are preserving our handicraft,” she said. With beautiful patterns of terraced rice fields, trees, flowers and humans, embroidered products made by Mảy and others villagers in Tả Phìn have earned a reputation in the nearby town of Sa Pa.
Popular products include traditional scarves, skirts and decorative designs for the back of their shirts. It can take from three to 10 months to finish outfits for brides and grooms. Embroiderers usually use silk and wool on cloth coloured in plant dye. Mảy and some of her relatives are working on a social project to preserve the craft in the village. 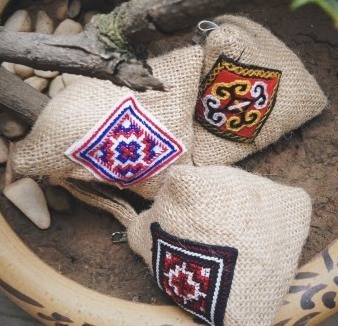 Their products are being displayed at souvenir shops in Sa Pa and Le Chalet Việt Nam in Hà Nội, a social charity project which offers a fresh take on traditional ethnic aesthetics, resulting in unique and beautiful gifts. Prof Nguyễn Văn Huy, a Vietnamese cultural researcher and former director of the Việt Nam Museum of Ethnology, said the preservation and development of traditional handicrafts among ethnic minorities in the northwestern region helped improve their economic value, and also played an important part in the preservation of national culture and traditions. “From embroidery to brocade, it shows the subtle skills workers use to make beautiful and long-lasting products. Their products are not just for sale; they capture the quintessence of a national culture that needs to be preserved,” said Huy. Some experts said the preservation of traditional craft villages should be the responsibility of cultural authorities at all levels that matches everyday life. Starting in January 2015, the not–for–profit, pro–community project run by Le Chalet Vietnam – a handicraft gift production chain in Hà Nội – in partnership with Lumikello, a charity fund from Finland, has helped preserve traditional embroidering in Tả Phìn while at the same time supporting local people and helping improve their living conditions. “The project’s aim is to develop a diverse and beautiful range of traditional handicraft products by collaborating with local producers and craftspeople, working to ensure that these producers are able to sustain their traditional techniques whilst creating marketable products and obtaining a fair price for their handicrafts,” Đặng Tú Anh, manager of Le Chalet Vietnam, told Việt Nam News. Handicraft production must be linked to consumption demand with more support from authorities and advertising and promotion campaigns. “To restore, preserve and promote traditional ethnic handicrafts, we need to improve community awareness on the importance of the crafts,” said Ngô Quang Hưng, another researcher. 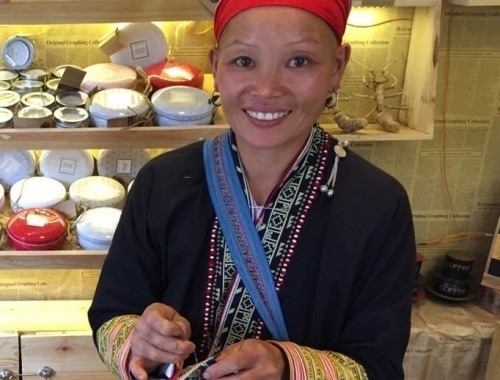 Hưng said that respect and an improved awareness on the preservation of traditional crafts would automatically help locals engage in preserving them by passing them down to younger generations. Lào Cai Province has been working on policies to preserve traditional handicrafts which have been on a sharp decline in recent decades due to a booming market economy and more imported products, particularly from China, flooding the local market. In Sa Pa District, only 11 handicraft villages in the communes of Tả Phìn, San Sả Hồ and Sa Pả have maintained their embroidery and weaving craft with a workforce of 1,000 households who provide about 35,000m of products to local markets, according to a report. The Government and local authorities should work closely with ethnic communities to find markets for their products and turn them into a tourism attraction that creates stable incomes for workers, according to Hưng.